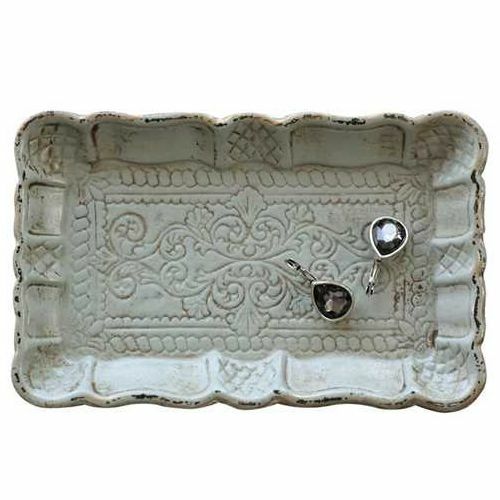 This small Decorative Wood Tray with Scalloped Edges from Creative Co-op can be used just about anywhere. It measures 7 1/4" L x 4 1/2" W. It has a distressed vintage look and is painted in a grayish aqua which goes with almost any decor. It is the perfect size for small trinkets and jewelry. Each tray has a worn and weathered look. They are handpainted so each one varies slightly. The tray is flat has does not have legs. NOTE: Decoritive use Only. NOT for Food. NOT food safe. COLOR: Distressed Gray with a hint of Aqua.